Refreshing gel. 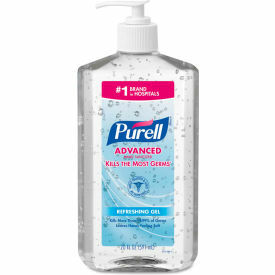 Kills more than 99.99% of most common germs that may cause illness. Outperforms other hand sanitizers ounce-for-ounce¹. Clinically-proven to maintain skin health². America's #1 Instant Hand Sanitizer³. Hand Sanitizers Type: Gel; Color(s): Clear; Capacity (Volume): 20 fl oz; Packing Type: Bottles.